Every person who begins a small business usually does so because of a passion. They pour enormous amounts of energy, time, and money into making the dream become a success – both in its mission and financially. They dream of the day when the business is profitable. Then, with hard work, determination, stout decisions, and some luck, the dream comes true! The business becomes profitable. This is when a massive and critical decision is made that could ultimately dictate the entire future of the company: Should we SPEND all of the profits (to grow the business or on other personal dreams) or should we SAVE the profits? Or is there an appropriate balance between SPENDING and SAVING? I encourage you to chose to build FINANCIAL MARGIN by SAVING the majority of the first profits of the company! While I know you see incredible future opportunity that could potentially be realized by reinvesting (spending) the money back into the company, I believe financial margin is far more important to long term success of the company. A great way to describe this savings is an “Obstacles & Opportunities Fund” (O & O Fund). Having this account fully funded allows you to encounter obstacles head on without it impacting your daily operations (not so fun) and to take advantage of tremendous opportunities when they appear before you (a lot more fun). It is appropriate to place 4 to 6 weeks of operating expenses in a beginner O & O Fund. Long term, it is desirable to have at least 12 weeks of operating expenses. Long Term and Strategic Focus When you are strapped for cash, all of your time will be consumed with tactical decision-making. You will constantly be plagued with liquidity and working capital issues. Happy Suppliers Margin allows you pay bills on-time and early. Clients who pay on-time and early receive preferential treatment over slow-paying ones. Happy Customers Companies that are strapped for cash can be tempted to cut corners which can lead to service or quality issues. Happy Employees There is nothing that will make your best employees run for the exits like missed payroll. Margin ensures this isn’t EVER a problem. Restful Sleep You will sleep better when you know the bills are paid and you are prepared for unplanned obstacles. Investment Opportunities When you have financial margin, you will see opportunities you would NEVER see if you were broke. It’s an amazing phenomena I’ve witnessed many times. Better Profit Margins Broke companies who are strapped for cash put valuable products and services on sale or issue major discounts for early payment – all done to generate immediate cash to solve cash flow problems. It is literally equivalent to mortgaging the future. Companies with margin won’t engage in such behavior – because they don’t have to! It’s never easy to force your organization to save. There will always be competing priorities. Chose to make Financial Margin the top priority. Your financial manager will thank you. And then you will thank me when you are able to jump on a major opportunity – all because you chose to build financial margin. 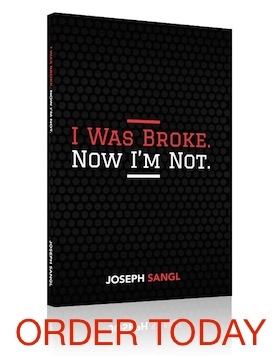 NOTE: Welcome to the “Small Business Success Tips” series here at the wildly popular JosephSangl.com! Click HERE to access all previous tips in this series.